First published in Steven's Window, a column in The National newspaper of Papua New Guinea. Friday 19th, February, 2010; p.5. The dailies, on Thursday 28th, 2010, covered the news on 20 containers of books shipped from Australia to Port Moresby and Lae for distribution to schools around the country. It sounded to me as the best news before schools began this year. From the newspaper reports I gathered that the number of books destined for primary schools is 539,000 books. It was revealed that the textbooks were funded by the Australian government through its AUSAID program in consultation with the Department of Education through its Curriculum Division. The cost involved is about K20 million to purchase, ship, and distribute the books to primary schools and teachers colleges around the country. I applaud this commitment from the PNG government and the Australian government through their respective agencies to flood our primary schools and teachers colleges with books and reading materials. The massive book flood is very costly, yet it seems like a worthy cause to have developmental grants quickly disbursed for quick commitments. In between the fine prints of the news on this book flood several issues remain etched uneasily in the throes of the PNG Education Department’s Curriculum Division and the AUSAID office. The amount used for purchase of books for our schools is massive. I asked myself one question soon after reading this good news: Should some of these funds be set aside to purchase books and resource materials written by Papua New Guinean writers? Our local writers have written and published books and resource materials for use in schools. Half of what was spent on purchasing books in Australia could have been used to purchase books from local authors, reprint Papua New Guinean classics, assist local publishers in publishing and reprinting costs, and running writing, editing, and publishing courses for Papua New Guinean teachers to learn how to write, edit, and publish locally relevant materials for use in their schools. Several local authors with excellent books appropriate for primary schools and colleges expressed disappointment that their books were ignored in the process of selection. It makes no sense to snub local authors and import books that has little relevance to the local culture and society. I have argued in some of my earlier articles that local authors must be supported by the government as well as the development partners where books and reading materials are concerned. Many Papua New Guineans are writing books now-a-days and having them published with little support from the government. Many local writers struggle to have their first books published, let alone if they have one book published it is either because they are lucky or that by some sheer miracle they stumbled on to some charitable sources or from the personal sacrifices they have to make in order to get the book published. Some of these writers have paid local and international publishers and printers amounts between K6,000.00 and K20,000.00 to have their first 1,000 books published and printed. That amount is difficult to recover in a scenario where the PNG Education Department’s curriculum officers become turn-coats and collude with the funding agencies to ignore the plight of Papua New Guinean authors. The problem is further compounded with the inability of the National Library to pay local authors to have their books distributed to school libraries around the country. The scenario gets even abysmal when schools and colleges pay books with bad cheques after receiving their books from an author or publisher. Bookshops and stationery shops also add to the woes and wounds of the local writer when they are unable to sell books by local authors, fail to pay for the books they ordered from the authors or publishers, and when they care less about the local literary scene. There are exceptional ones that support the works of local authors such as the UNIBookshop and Theodist Limited. The poor attitude to local writers and the ambivalent situation of local literary art scene and book trade have a negative impact on the results expected of an Outcome Based Education. 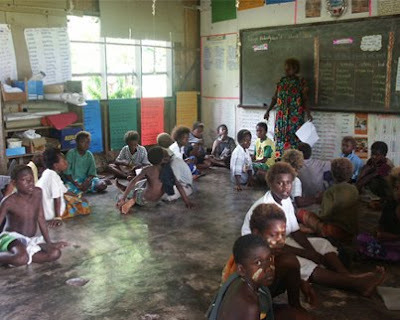 Papua New Guinea will remain handicap in the production of its own literary and school materials and the implementation of the curriculum will have a zero movement forward. The views I express here are the sentiments I share with many Papua New Guinean writers and would be writers. I have talked to many former primary and secondary school teachers who are writing books. They want the Education Department to help them publish their books for use in their schools. The Education Department is unable to support creative endeavors and local materials production and book publishing. Perhaps one suggestion is for the Education Department to work with writers, local publishers, and printers to produce locally relevant materials for use in schools. For example, it could work with several writers, teachers, publishers, and printers to produce locally written books that get absorbed into the school curriculums. Quality local content and text could be printed on affordable paper thereby increasing the quantity of prints at minimal cost, enough to distribute a copy of one book to every school child in Papua New Guinea. A final point to consider: Instead of developmental partners of Papua New Guinea taking back their money set aside for book purchase they should build school libraries, strengthen local book publishing capacity, and assist the government in setting up programs and projects to enable Papua New Guineans to write and publish their own books. This may sound wishful, but if we think about it, it makes sense as it involves several government departments and agencies such as the Department of Education, Department of Community Development, the National Cultural Commission, the University of Papua New Guinea, NARI, NRI, Divine Word University, and various international and church organizations. Many of them are involve in book production and publishing that a concerted effort is needed if funding is set aside for writing and book publishing. Books published in the programs and by these organizations can then be absorbed in the education system of Papua New Guinea. I am a new writer of a book titled "The First Melanesian" and searching for a publishing company. Can I be assisted in its edit and publishing through the manuscript that be send if you decide to help.